ISLAMABAD — Heavy fighting is raging in central Afghanistan where officials say the Islamist Taliban has captured two key district headquarters and is assaulting government outposts in nearby areas. Insurgents stormed Taywara district in Ghor province early Sunday, after seizing control of the border district of Kohistan in the adjoining northern province of Faryab, according to Afghan and Taliban officials. 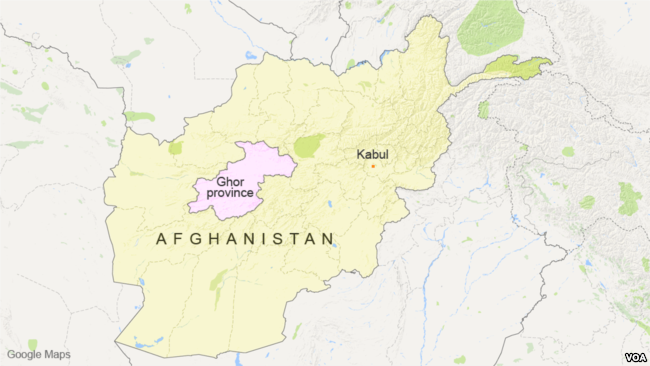 Ghor’s governor Nasir Khazay told VOA thousands of Taliban fighters participated in the pre-dawn attack on Taywara and faced strong resistance from Afghan forces before overrunning it. A government spokesman in Faryab told VOA around 700 Taliban insurgents overnight attacked Kohistan and swiftly captured key installations, including the police headquarters, before establishing control over the entire district. Abdul Karim Youresh said that as many as 200 Afghan security forces have been cornered in a remote village in the district also known as Lawlash, and urgently need reinforcements. Insurgents are attacking government positions in eight other districts of Faryab, according to Afghan media. A Taliban spokesman, Zabihullah Mujahid, claimed rebels inflicted heavy casualties on government forces and killed dozens of them in the fighting for the control of the two districts. It was not possible to independently verify the claims and Afghan officials would not discuss casualty details saying clashes were still underway in the area. Taliban insurgents have also besieged the Khanabad district of the northern Kunduz province. Afghan officials, meanwhile, have confirmed insurgents ambushed and killed at least 35 Afghan forces in the neighboring northeastern Badakhshan province Friday. Clashes are also raging in volatile southern Helmand province where an American drone strike mistakenly killed at least 15 Afghan security forces during Friday’s clashes in the Gereshk district. The Taliban has intensified insurgent activities across the country as U.S. President Donald Trump’s administration is about to complete its much-awaited comprehensive review of Afghan policy. The new policy may involve intensified U.S. military operations, including the addition of several thousand troops, to enable Afghan security forces reverse insurgent gains. At the start of this year’s fighting season, the Afghan government was in control of less than 60 percent of territory while the Taliban controlled or influenced the rest, according to U.S. military assessments. The Trump administration is also expected to take a tougher posture towards neighboring Pakistan that Washington blames for the military stalemate in Afghanistan. U.S. military officials maintain Taliban insurgents and their dreaded ally, the Haqqani network, are using sanctuaries on Pakistani soil to sustain the Afghan insurgency. Islamabad denies the charges. On Friday, Defense Secretary Jim Mattis told reporters that the Pentagon has withheld 50 million dollars in military assistance to Pakistan because the country was not taking enough action to counter activities of Haqqanis.